At Mickey's Halloween Party, there are many places to trick or treat. And though you can just buy candy for yourself for far less, there seems to be a certain magic and attraction to going out and getting candy from door to door at Disneyland. This continues throughout the night, as guest in and out of costume partake in the festivities. It actually gets kind of addictive, going from station to station just to be able to say you've collected everywhere Disneyland offers candy. It's all just a part of the Halloween vibe at the Disneyland Resort! 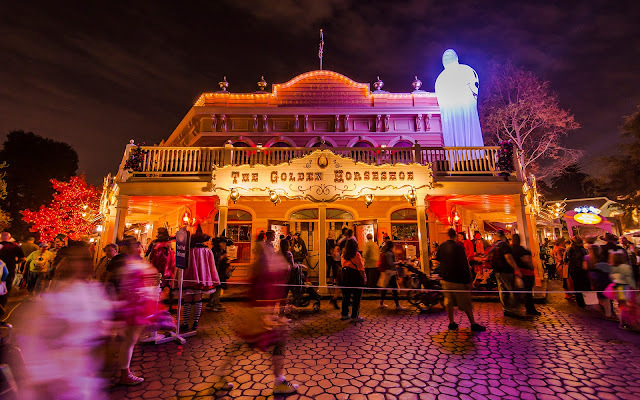 Crowds pass through the Golden Horseshoe, collecting candy.